Here is the list of elected positions for the term of office May 1, 2019 to April 30, 2020. 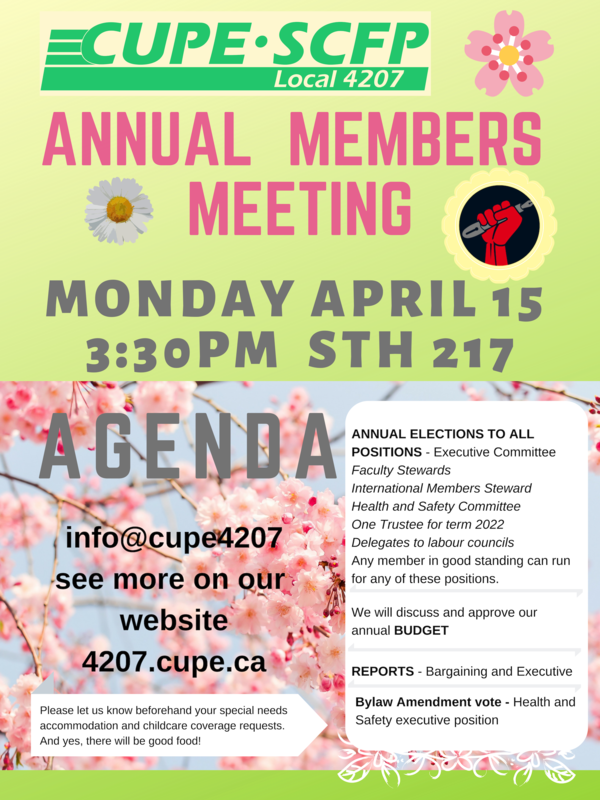 The elections took place at our Annual General Members meeting on April 15 in STH 217. After processing results from Unit 1 bargaining surveys the Unit 1 Bargaining Committee calls on three general members’ meeting on bargaining priorities The most pressing workplace issues are going to be presented and discussed at two meetings on April 2 and 4, and the fleshed out priorities voted on at the April 10 meeting. Members who currently hold an appointment apply as internal applicants. Members who are not currently working at Brock apply as external applicants. 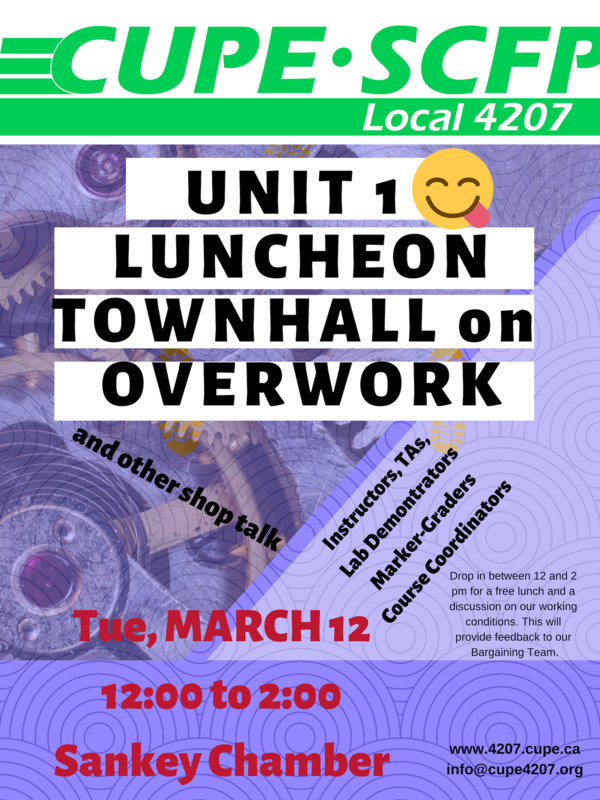 Here is an opportunity to get together, have some great lunch prepared by CUPE 1295 and chat about our working conditions – concerns that would provide feedback and support for our bargaining team. From 12:00 noon to 2 pm in Sankey Chamber on Tuesday March 12. Spread the word, talk to your fellow coworkers. There is a strength in finding common interest and experience. The bargaining survey has been emailed directly from Survey Monkey to members on February 27th. 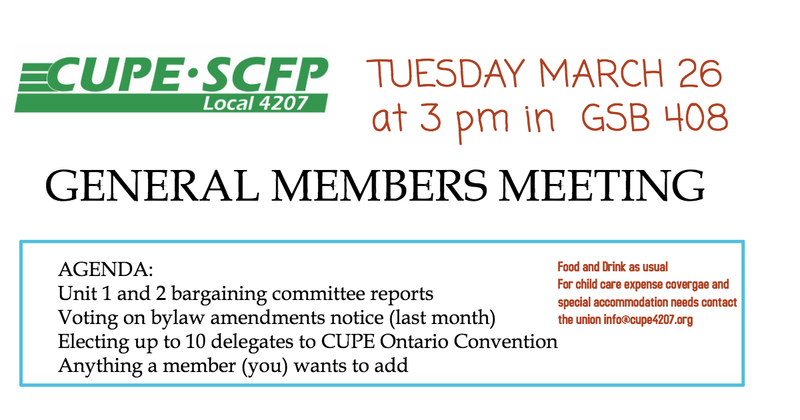 If you have not received it, please contact info@cupe4207.org or ext. 4766. 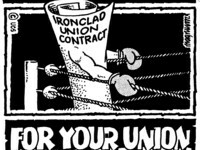 Our union began the bargaining process with the election of your Bargaining Committee (us!) at the November GMM. Bargaining will commence over the Summer prior to the expiry of our agreement in September. Given the cutbacks to funding initiated by the Conservative Government, this round of bargaining will most likely prove challenging. However, the more members are involved, the stronger we will be in negotiating a fair and better collective agreement that recognizes the work that we do while providing the resources necessary to do that work.